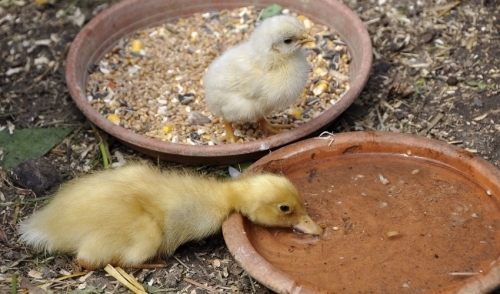 Water is essential in your poultry surviving the hot weather. Here are some tips for keeping your poultry hydrated during the summer months. Position water containers in the shade. If water is too hot (or too cold) chickens will not drink enough to keep egg production up. Adjust waterers to shoulder height. This will help keep the litter dry. If food, bedding or feces gets into drinking water, change it. Ducklings and goslings need access to fresh, clean drinking water. However, they love to play in water and will quickly soil it. Use a water dispenser that allows only their bills to enter. Put distance between their feed and water dispensers to prevent cross contamination. Grown ducks need access to water at least one or two inches deep in order to groom themselves. Ducks and geese do not require swimming water, but they must always have fresh drinking water available. Baby turkeys sometimes need extra coaxing to drink water. One trick is to put a few bright-colored marbles in their water. When they peck at the marbles, their beaks will slip into the water. Pretty soon, they’ll get the hang of it. Remove the marbles before the birds get enough to swallow them.